First Man was not a box office flop, grossing a tad over $100 million on a $59 million budget, but it vastly under-performed based on expectations. It re-teamed Academy Award-winning director Damien Chazelle with his La La Land star Ryan Gosling in a story about the early days of the space race and the life behind the first man to walk on the moon, Neil Armstrong. There was a lot of buzz, a lot of promotion, a lot of hype to see Chazelle’s follow-up to La La Land, but then First Man came out, and then nothing. While the publish date on this is November 2018 when I saw the movie, I’m writing this towards the end of January 2019 after Oscar nominations have been announced. What once had been considered a Best Picture hopeful, First Man was only nominated in four categories, all below the line. There are many categories, like acting, where First Man excelled in, but the dearth of nominations does not do justice to what I think is a phenomenal film. I do bring a heavy bias to the film though, having watched a great deal of space-based films, documentaries, and more in my lifetime. Just behind a good one-location film (especially if that location is on a train), my next biggest soft spot for films is ones dealing with space. Arguably, First Man is more about the story of Armstrong (Gosling) than it is NASA, the Apollo program, and the moon, but it is also not really possible to separate the two. Specifics are hazy (again, writing this almost three months after seeing it), but I still have very positive memories seeing this movie in the theater. I walked away in reflection as First Man can take a decent emotional toll. Both Neil and Janet Shearon Armstrong (Claire Foy) are deep, complex characters. Neil is quite shy and does not always speak a lot, but his silence and introspection can carry a scene. Janet is a bit of a contrast, taking a more outwardly-facing, emphatic positions, but Foy’s performance is also very nuanced, bringing a lot of care, love, and aversion to some of the developments in the Armstrong household. Gosling and Foy together, and the story of the Armstrongs do help to take First Man to another atmosphere, so-to-speak, and bring a very human element into the people behind the space race. One part of the film I wanted to point out specifically was the score. Hearing this score in the theater, especially in an IMAX theater with louder and fuller sounds, was breathtaking (or, whatever the equivalent is for ears). It is not often a score strikes me so much during a movie that I listen to it on repeat for weeks afterward. I did that with Dunkirk in 2017 and then I have to go back to 2014 for both Interstellar and The Imitation Game to find similar examples. For all four of these scores, they standout as masterful works of art alone, but the real beauty of them is how perfectly they mesh with their respective films. It is like an extension of the visuals you see, adding more layers to an already intricate and decadent cake. To continue with this likely bad analogy, the score to First Man is like a great frosting — you could eat just the frosting itself, but it also makes the cake itself taste better than having it without frosting. Justin Hurwitz does an outstanding job weaving emotion, suspense, and tenderness into the score. Powerful and moving when combined with the visuals - especially a scene like the Apollo 11 liftoff. Already a jaw-dropping and intense sight to behold, rumbling in your seat with the subwoofers firing on all cylinders as the Saturn V rocket blasts off, but elevated that much more because of the sounds of the instruments and synths Hurwitz adds. And listening to it now while writing this, it is bringing back the same goosebumps I had while in the theater hearing it with the full force of surround-sound speakers. I’m taking the time to talk about the score here specifically because I really feel like Hurwitz was gypped (I could have sworn you spelt that word “jipped”) a nomination. I’m still bummed that Alexandre Desplat won in 2014 beating the aforementioned Interstellar and The Imitation Game (though the latter was also scored by Desplat), and again in 2017 with The Shape of Water score beating out Hans Zimmer’s Dunkirk. But in those years, my favorites were at least nominated. Going off some of the “Oscar snubs” articles, I think it is safe to say I was not the only one a bit shocked by the lack of a nomination for Best Original Score. Everyone might, and probably will not, like this film as much as I did. But for me, First Man hit all the right buttons and is right up my wheelhouse of favorite/enjoyable movies. If you are not as much into the space elements, there is a lot of character and story-development that should hook you. For those who want to focus mainly on the space and rockets parts, you can do that easily as well. 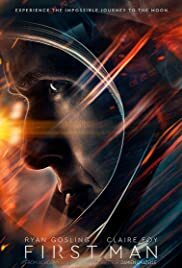 Any way you slice it, there should be something for most people to like and enjoy about First Man.